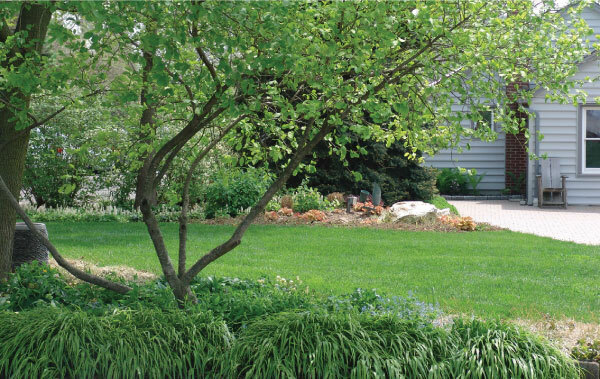 The benefits of a healthy, attractive lawn are many and diverse. Lawns prevent erosion, provide cooling, reduce dust and mud, remove pollutants from the environment, absorb carbon dioxide and produce oxygen. Lawns provide a safe, comfortable surface for many athletic and social activities. Areas of lawn, whether large or small, help bring green to the urban environment. Lawns provide the carpet upon which other plants are located and act as a unifying feature in the landscape. In fact, lawn is such an important component of most landscapes, its location should be planned when designing the landscape. Incorporate lawn to serve as play areas, pathways and gathering spaces. Once you have allocated useful spaces for lawn, manage everything else in the landscape as an alternative to lawn such as, forest or tree grove, meadow, or landscape bed. Lawns, like any living plant provide a number of environmental benefits, but they aren’t as effective at cleaning stormwater or supporting a diverse population of wildlife as other types of vegetation. So, it is important to limit their use to areas that require the functionality lawns provide. It is also important to manage the lawn properly. A “freedom lawn”, one with no maintenance other than mowing, is not environmentally sound. Research has shown that after a few years, lawns begin to thin, weeds take over, and erosion can more easily occur resulting in more phosphorus leaching into streams and rivers. But, always having the brightest green lawn, especially in the middle of a drought, is not environmentally sound either.